Whether you are a new parent or already have three children, learning “how to change a baby’s diaper” is not hard. If you have ever played with dolls and put clothes and diapers on them then you can do it with a real baby. You just have to be gentler and easier, so the baby does not get hurt. Like everything else, practice makes perfect, so with a little practice on changing your baby’s diaper you will get to be a pro at it. Make sure everything you need to change a diaper is within hands reach. If you have a changing table, that is the best place to change your baby’s diaper. 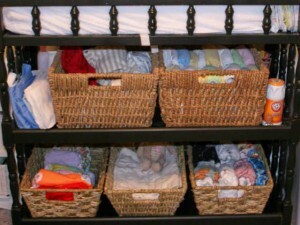 The changing table can be loaded with everything you need before beginning. You will need a diaper, baby wipes, diaper cream or powder, whichever is preferred. If there is no changing table then make sure everything is gathered before starting on changing the baby’s diaper because you never want to leave a baby alone, they can roll off, unless the diaper change is being done in a baby bed, with rails. After you have everything you need for changing your baby’s diaper, follow these guidelines on “How to change a baby’s diaper.” First put your baby on the changing table or if you don’t have one then put her/ him wherever you need to, too change the diaper. Take the clean diaper and unfold it and lay it beside the baby, undo the dirty diaper that is on the baby, by pulling the tabs away from the front of the diaper, fold tabs down so they don’t stick to baby. If changing diaper on a boy, you may want to cover his little private area so you don’t get sprayed. Baby boys will urinate when diaper is taken off and he will spray you, so put a wash cloth or baby blanket or something over him till you get the clean diaper put on him. Lightly grab the baby’s feet at the ankles with your left hand and grab the dirty diaper with your right hand, if baby has pooped then take edge of diaper and wipe baby’s bottom, barely pull baby’s bottom up and with right hand, fold dirty diaper up as you pull it out from under his or her bottom. Use a baby wipe to clean baby’s bottom and private area but wipe from front to back (girl) and not back to front. When the baby’s bottom is clean, take clean diaper and slide it up under the baby’s bottom, with the tabs on bottom, and not on top. Slowly lower baby’s bottom onto clean diaper, add cream or ointment to baby and then pull diaper up between baby’s legs, comfortably. While holding top of diaper in place, undo the sticky tabs, one at a time and fasten to top of diaper. Wrap dirty baby wipe up in dirty diaper, take tabs and fasten diaper closed and throw into a diaper genie or something for dirty diapers, You are now done with changing your baby’s diaper and that is “How to change a baby’s diaper.” Clean and disinfect everything for the next changing.